Previously happy children became aggressive, were afraid of water and even stopped talking after they were abused at a day care center in Northern Virginia, emotional parents testified Monday in Manassas. The trial of Sarah Jordan began Monday. Jordan is one of two women accused of abusing children age 16 months to 2 years old at Minnieland Academy at The Glen in Woodbridge. Jordan faces 37 charges in the alleged abuse of 13 toddlers. Police say the behavior is the result of Jordan and Kierra Spriggs, who also is accused of abuse, spraying children with a hose and encouraging them to bite and fight each other. One father, Adam Smith, testified that his daughter "completely stopped talking" once she was in Jordan's care. "She would stomp her mom's feet. She would run in and slap us for no apparent reason and start giggling," Smith said. The allegations against the two Minnieland workers surfaced in fall 2013, after a coworker of the women called child protective services. Desiree Edwards, who also worked with the toddlers, said Monday she saw Jordan trip a running child and then laugh. On another occasion, Jordan dumped water on a little girl's head, making her cry, Edwards said. 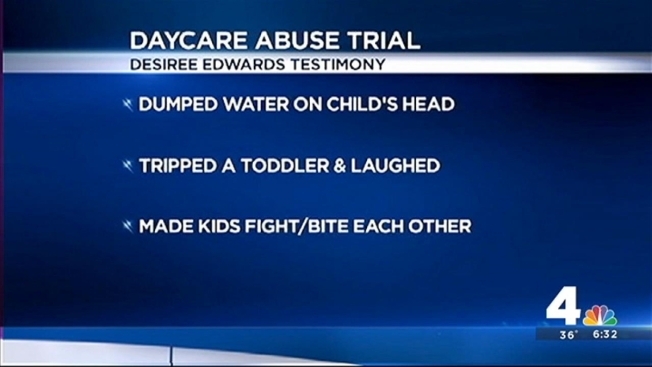 Edwards testified that she reported the abuse to Minnieland management and was told bosses would observe the classroom via cameras. When no action was taken, she called the county. All but one of the families involved in the case removed their children from the center, and many said they have met with therapists. Jordan has maintained her innocence since she initially was charged. The defense is expected to call witnesses on Tuesday. Fellow teacher Spriggs faces trial next month.